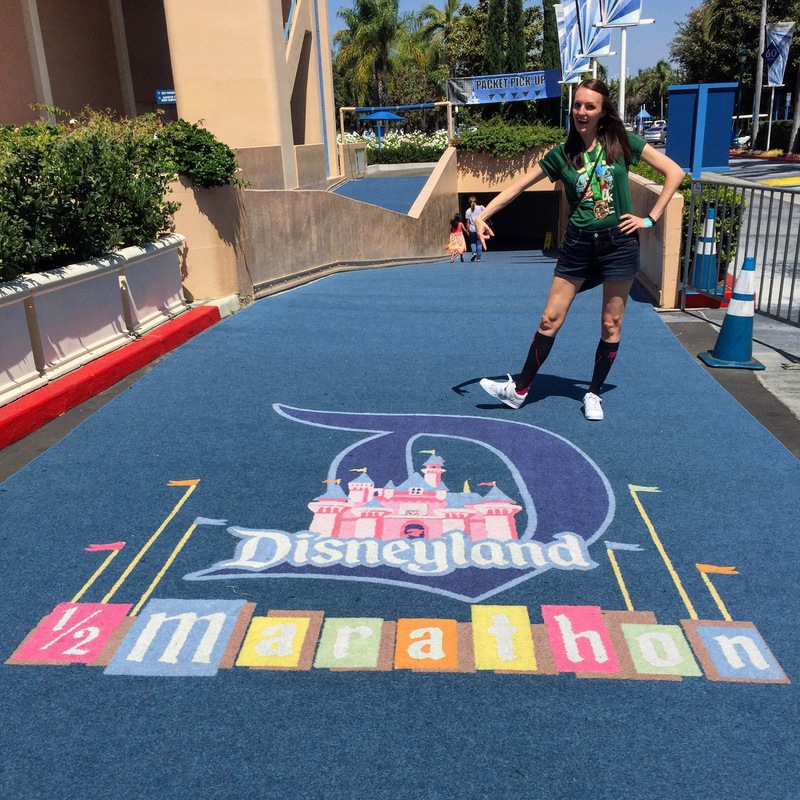 Where to begin with the Disneyland Half Marathon?! We went into it not really knowing what to expect and, considering we’d just run a 10K the day before, just wanted to finish the race. 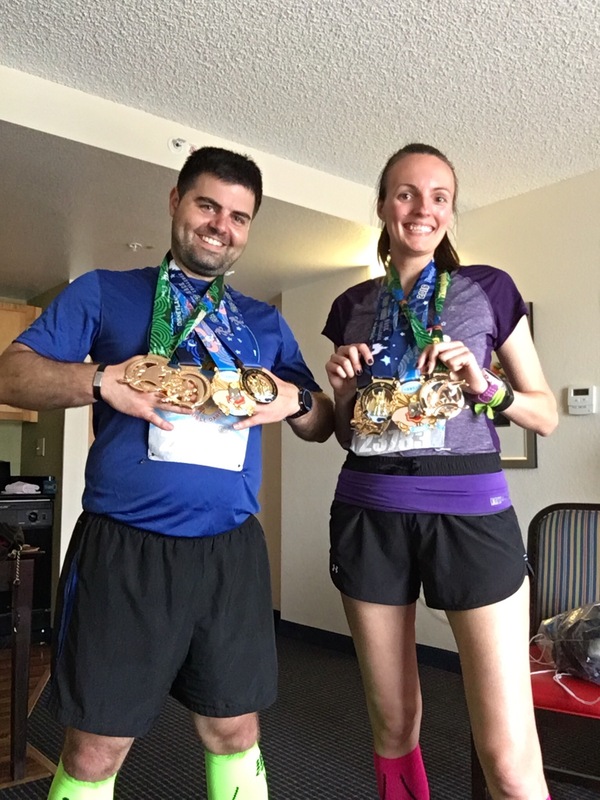 Well, I’m so proud to say that not only did we finish the race, we also got a PR, beating our previous half marathon time by nearly 20 minutes! 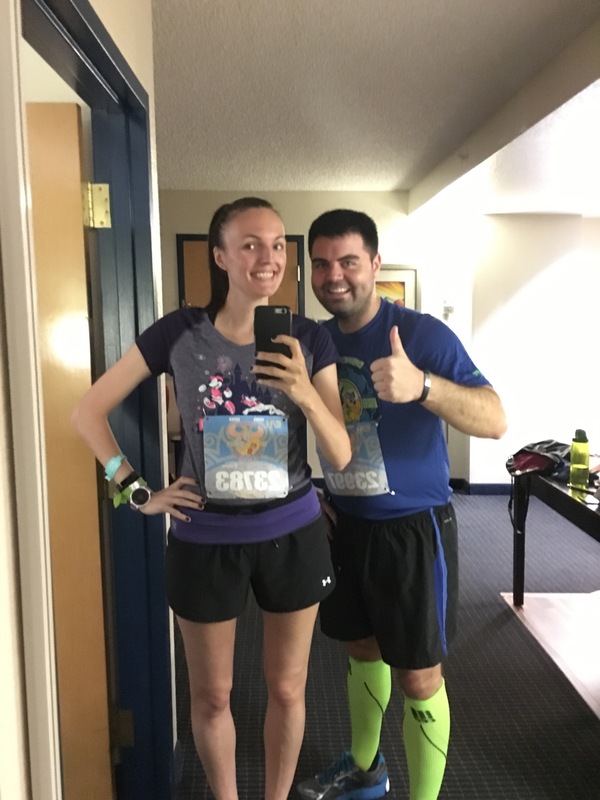 After the 10K, we went back to our hotel to freshen up and then hit the Expo at the Disneyland Hotel one last time. Connor got an awesome pair of Dumbo-themed New Balance shoes (that came with cute socks that say “fly” on them and were 30% off because we were doing the Dumbo Double Dare) and I splurged on a special RunDisney Dooney & Burke wristlet (I mean…it has Pluto and Mickey running on it and it’s a limited edition for the Disneyland Half Marathon weekend…so obviously I had to get it). Alright, on to the race! You know, 3am wakeup calls are really not that bad when you go to bed before 9pm the night before. Just sayin. Keeping our bodies on an East Coast schedule was really one of the best things we did! 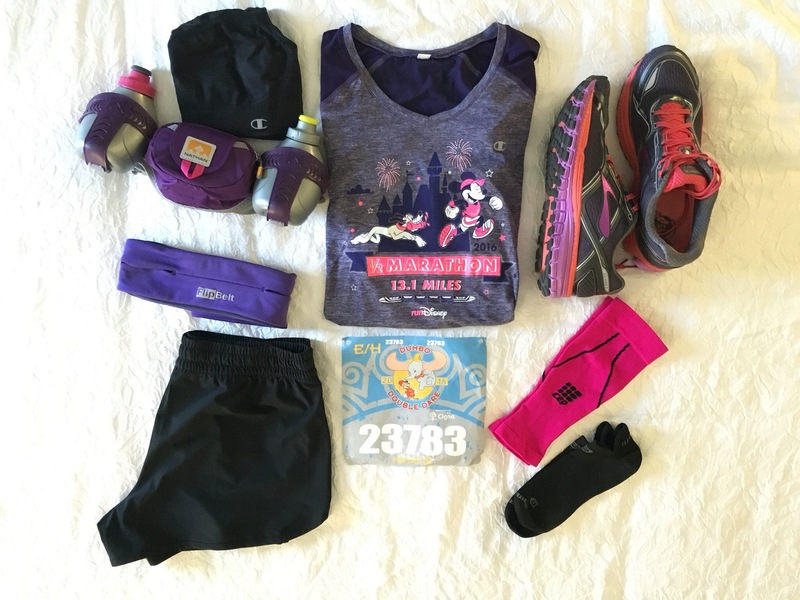 Clothes were laid out the night before (see below – I wore this really cool Disneyland Half shirt with Mickey and Pluto on it, and a keyhole back, that I got at the Expo) and we enjoyed our usual pre-run breakfast of an english muffin with peanut butter and split a ThinkThin chocolate peanut butter protein bar about a half hour before the race. For this race we were in corral H and crossed the starting line around 6:10am (official start time was 5:30am). 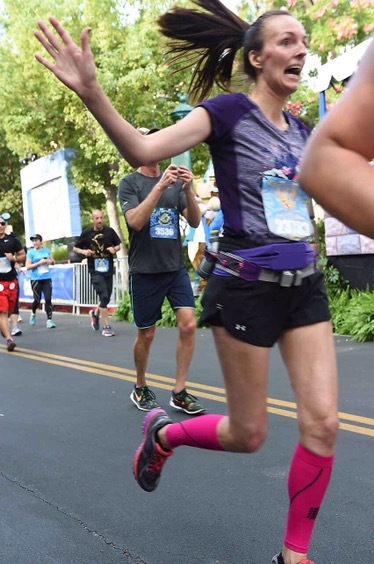 The first 3 or so miles of this course were entirely through Disneyland property and then we were out on the streets of Anaheim! We planned on doing 6 minutes running by 4 minutes walking until mile 10 and then play the rest by ear. Well, that went right out the window at the beginning because of the momentum of running through the parks and being in areas we hadn’t yet explored, like Cars Land (we got so distracted by the cool scenery). Once we got out on the streets, we were eventually able to get our 6×4 groove back (hello, immediate hill and sunrise)! Surprisingly, this was the part I dreaded the most; and surprisingly, it went by so fast! I didn’t hit that mile 8 wall that I did back in January during our first half marathon. While we were running through city streets, there were bands and dancers around as well as a huge stretch of classic cars around mile 7 which was really neat. I think all the activity and enthusiasm around us (plus all the different things to look at, haha) really helped propel us through this stretch. I hit my low spot of the run (hey, it happens to us all at some point) right after getting out of the stadium parking lot. I had a weird shoulder cramp and was starting to feel some effects/tiredness of the 10K the day before. During our walk break mid-mile 10, we realized that we were completely capable of whooping our last half marathon time…say what now?! We took a slightly longer walk break until mile 11, then popped open our final GU (saved my fave cherry lime till last! ), and decided to just go for it! I mean, we knew we were going to be a little sore anyway, right? 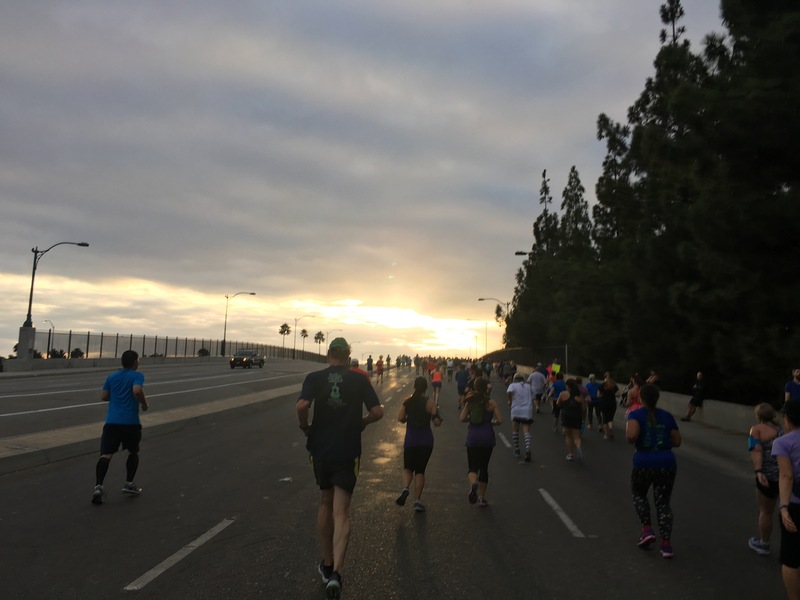 We really dug deep during those last 2-ish miles (which are honestly a bit of a blur for me…and I’m not just talking about being blinded by the LA sunrise). I think we tried to stick with 6×4 for a bit but ended up taking a few short walk breaks while running backstage at California Adventure so that we could finish strong. Obviously at mile 12 we cranked it up a bit (a la Aaron Rodgers #crankitupto12). We flew through the last 1.1 miles, grabbed hands, and crossed the finish line with a time of 2:32:20. And we couldn’t have been happier! 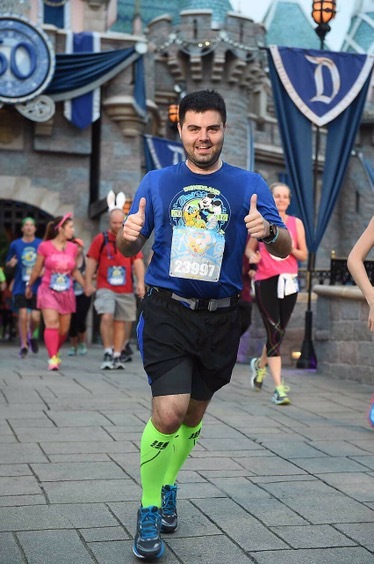 I know I’ve said this before, but I feel like it’s always worth repeating: the Run Disney cast members and volunteers are so nice and so organized! After crossing the finish line, it was like a well-oiled machine getting our medals, cooling towels, water/Gatorade, etc. 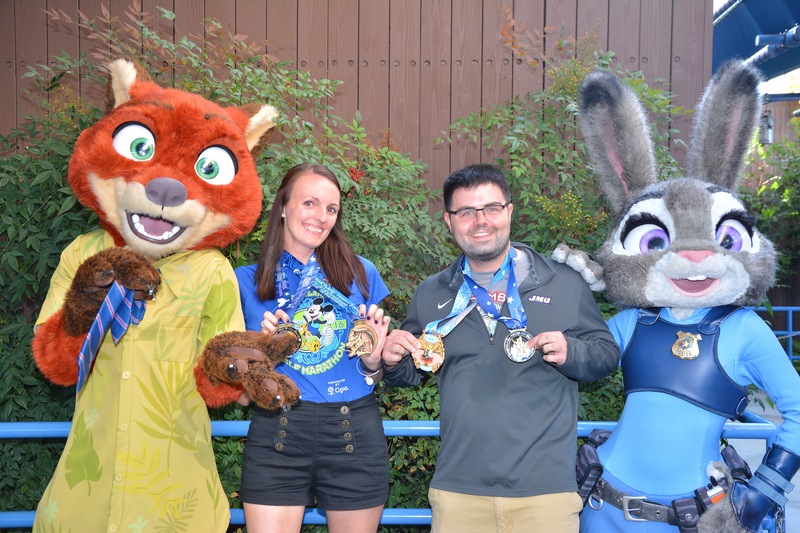 We didn’t stick around the finish area very long (frankly, we were so sweaty and, unlike WDW, there weren’t any post-race character photo-ops). 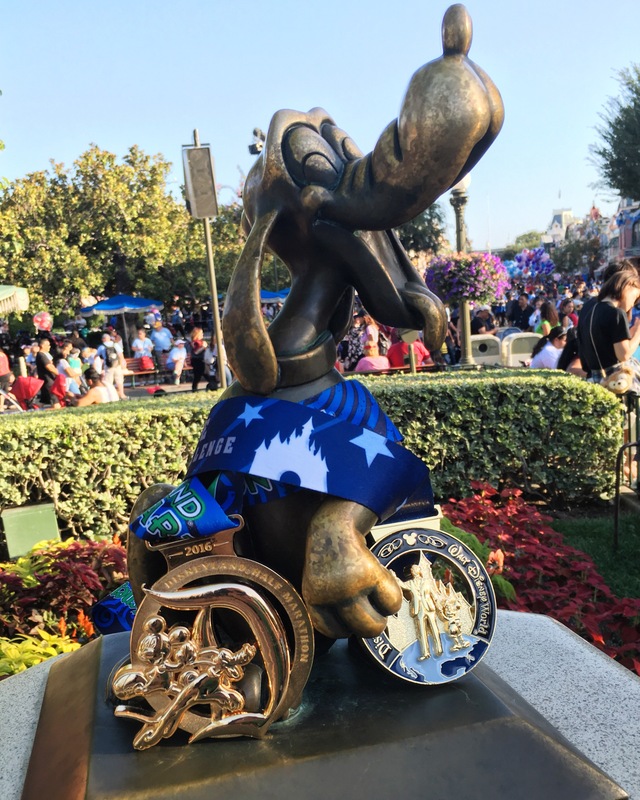 Here’s a bling shot with all four medals: the 10K, the half marathon, the Dumbo Double Dare, and the Coast-to-Coast Challenge. After we stretched, showered, and cleaned up, we hit the parks! We got some great pics and had our traditional post-race Dole Whip, like ya do. Here are a few other favorite shots from the day: our awesome action shots, running with Pluto (naturally), and of course a castle shot. If you’ve made it this far, congratulations! 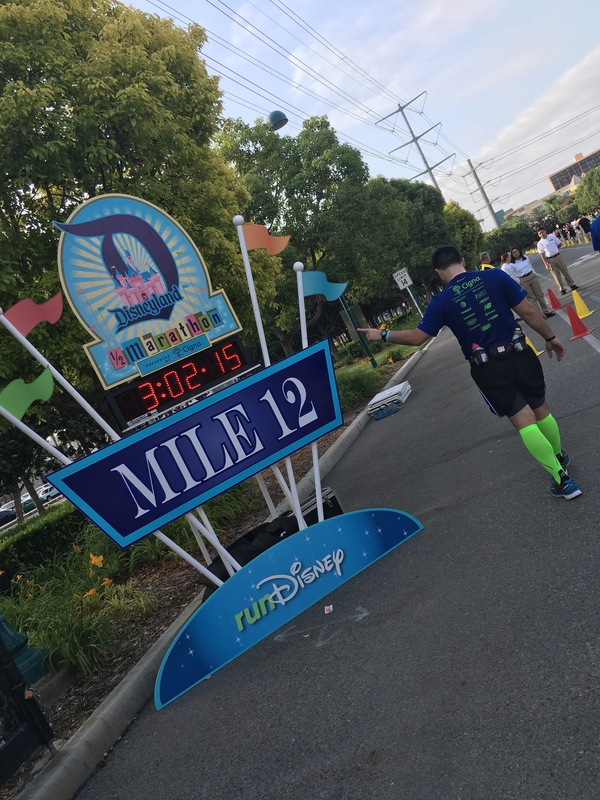 We hope you’ve enjoyed reading about our Dumbo Double Dare adventures as much as we enjoyed doing it! As many of you know, in addition to our running challenge, we also had a fundraising goal to meet in support of Autism Speaks. 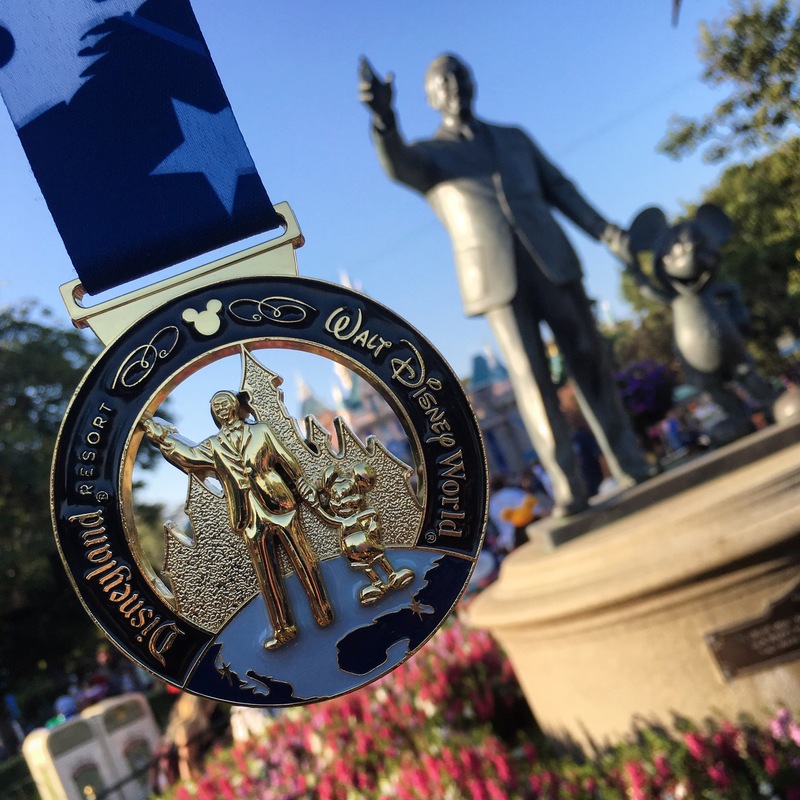 Well, I am so proud to say that not only did we exceed our goal (by around $175), but we were among the top 5 fundraisers running during the Disneyland Half Marathon Weekend. Our most sincere thanks to everyone who donated and support us both through the last 6 months. We could not have done it without you!